Knit a row, adding some yarnovers to start a pretty pattern. Knit a row, adding some more yarnovers to continue the pattern. Knit a row, adding some more yarnovers. Hey, wait! Where’d all these extra stitches come from? I guess I’d better bind them off until I have the right number, and then I’ll knit back. Of course, it’s actually more deliberate than that. The bound off stitches take the place of decreases, in the process making a decorative sawtooth edge. There’s a number of examples of this kind of lace around; one place to see them is at knitting-and.com. I thought it might be fun to try it with a secret code chart or two. These are lace edgings such as might be found in a stitch dictionary. They are not patterns for a finished object. The thing to notice is that these aren’t mirrored from side to side. I think they’d be best around the edge of a bag or a petticoat or something so that the biased ends could nestle up to each other and be sewn together. Designers, please feel free to use these edgings in your patterns. I’d like credit but won’t be offended if people don’t give it. I started with the word “why”, just because I was feeling a bit silly. Why starts and ends with 7 stitches. Row 4: k8, p1, k2. Then I wanted a longer word because I wanted to play around with having two “teeth” for one “word”. I was having trouble thinking of anything, so I decided to get self-referential, and encoded the word edging. I like the way the alternating teeth are different sizes. Edging starts and ends with 8 stitches. Anyway, this was short and sweet and I had fun with it! It turned out not to be challenging at all – there’s no decisions to be made about where to place the decreases, since that’s dictated by the form itself. I so enjoy your blog, Naomi! 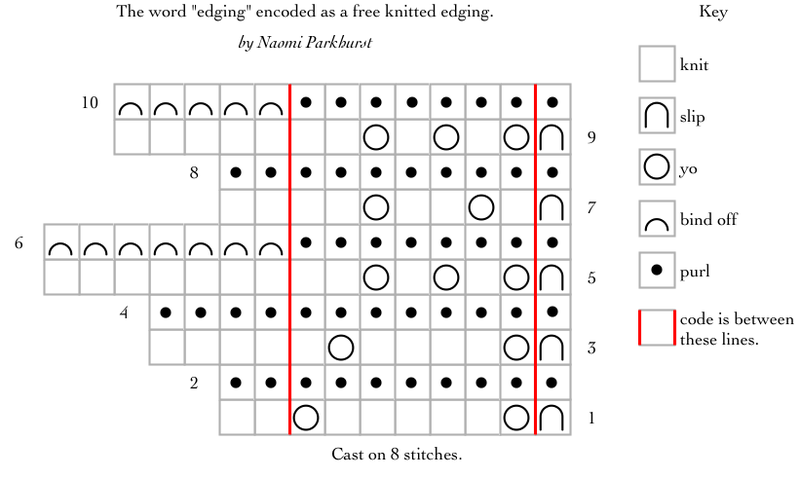 It’s fun to read about the technicalitites of stitch pattern design, not just the selection and arrangement of stitch patterns into a written pattern. The later is vital, of course, but I think I like stitch patterns themselves best. I’m intrigued that you have found a market for them too. I’ve been realizing that I like making stitch patterns more than I like designing finished objects. I mean, I enjoy that too, but stitch patterns also suit my tendency toward startitis. Stitch patterns are small and finished quickly. I’m glad you enjoy it; I enjoy writing it. Really Nifty, as usual! Now all I have to do is learn how to incorporate such edgings onto a finished work! Exactly: why not? And I’ll gladly show you how, you know that. I AM LOOKING FOR A PATTERN FOR BABY BLANKET I MADE 16 YEARS AGO-COUNTERPANE COTTAGE BABY BLANKET-I HAVE A PICTURE-CAN YOU HELP ME PLEASE? I’m afraid this isn’t the best place for questions like this – I am just one person, and my knowledge of blanket patterns is small. Both those groups have a lot of people using them, so it seems more likely that you’ll be able to find someone who will recognize your pattern.